In 1825 Impresario Green DeWitt obtained a six-year contract from the Mexican government to settle 400 immigrant families into an area that became known as the Green DeWitt Colony. DeWitt Colony was the western-most Anglo-American settlement in the Mexican State of Coahuila y Tejas. The colony’s capital, Gonzales, lay about midway between San Antonio de Bexar to the west and San Felipe, the capital of Austin’s colony to the east. Even before Green DeWitt negotiated his colony, the Mexican Government had concerns that immigrants from the United States were not loyal to Mexico and were scheming to have Texas annexed by the United States. By October 1835, Santa Anna had achieved dictatorial control over Mexico. These actions came as a surprise to many colonists who had known Santa Anna, remembered him as a defender of the Constitution of 1824 and a staunch federalist. Colonists now saw Santa Anna as a tyrannical aggressor. Five soldiers from San Antonio arrived on the western banks of the Guadalupe River in Gonzales. They came to retrieve a cannon placed there in 1831 for the colony’s protection against hostile Indians. The soldiers remained on the west bank of the Guadalupe River because the 18 able-bodied men in Gonzales at the time had moved the ferry and boats from the west banks of the river. Messages calling for help were sent to San Felipe and other settlements ranging from Victoria to Bastrop. Mexican Army Lieutenant Francisco Castaneda had arrived with 100 men and, unable to cross the river into town, traveled up-river and eventually camped in the area known as DeWitt’s mound. They then marched over four miles up-river to Ezekiel Williams’s farm, still on the west bank of the Guadalupe, and made their camp. The cannon had been buried in the Saint Louis street peach orchard belonging to George W. Davis. By the evening of September 30, over 150 Texian volunteers had joined the original 18 able-bodied men in Gonzales. The hand-made “Come and Take It” flag is said to have been crafted the night of October 1, 1835 from the skirt of Noami DeWitt’s wedding dress by Sarah Seely DeWitt and her daughter Evaline. The Texians dug up the cannon, mounted it on a wagon and unfurled the “Come and Take It” flag. At 7 p.m. Colonel John Henry Moore led more than 150 Texian Army recruits across the Guadalupe River. There was an unusually thick fog that morning, almost eerie according to some observers. About 4:00 a.m., the Texians formed for action. Mexican soldiers fired on the Texians, and one man was injured when his horse threw him. The Texians fired a volley, and one Mexican trooper was wounded. The Mexican soldiers retreated to wait until the fog lifted so they could see their targets. When the fog lifted about daylight, the Texians moved into an open field and began firing on the Mexican position. 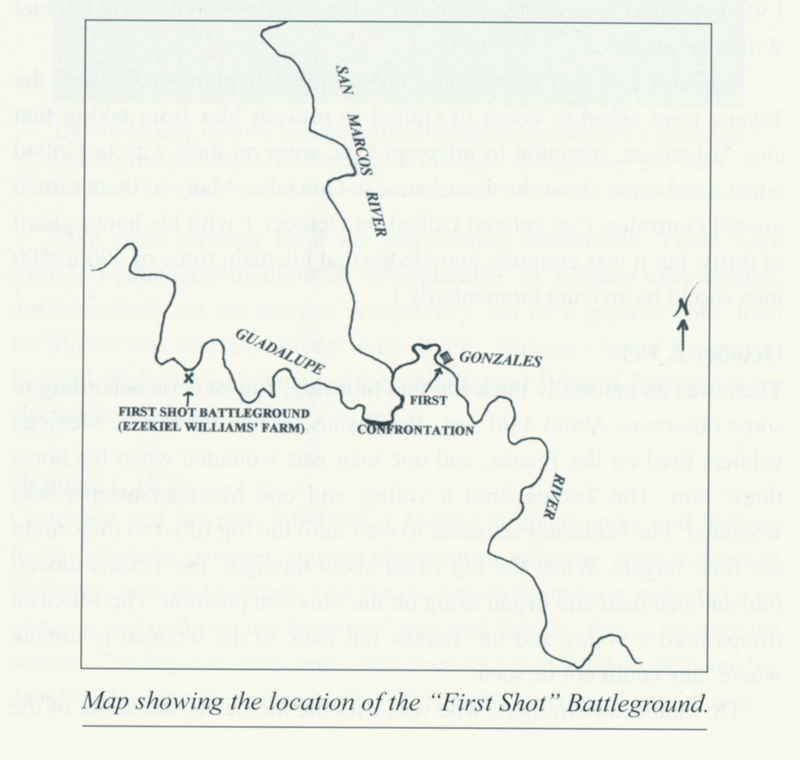 The Mexican troops fired a volley and the Texians fell back to the wooded riverbank where they could not be seen. Dr. Launcelot Smithers, who was with the Mexican army, raced out of the Mexican camp on horseback with a message for Colonel Moore requesting a meeting between the two leaders. Moore met with Castenada in the field, both men on horseback. Castenada asked why he had been fired upon. Moore replied that the Mexican troops represented Santa Anna who was the enemy of the colonists, and that the Texians were also fighting to preserve the Constitution of 1824. Castenada explained his position as an officer of the Mexican government. Moore suggested he either surrender and join the Texians in support of the Constitution of 1824, or prepare to fight. Castenada responded that he had to follow orders and return the cannon. Moore pointed to the cannon and told Castenada that the little cannon was on the field, so he should just try to “Come and Take It”. The flag stating the Texians’ sentiments was flying defiantly over the cannon. Moore then wheeled around. He shouted “Fire”- and a shot was fired from the little cannon. The Mexican troops immediately wheeled around and withdrew to San Antonio.